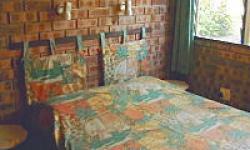 St. Lucia Wilds Self Catering offer self-catering holiday accommodation in St. Lucia on the KwaZulu-Natal coast of South Africa. Accommodation for couples, single travellers, families, birding enthusiasts, eco-tourists, self-drive tourists and backpacker type tourists who prefer "no sharing" accommodation. 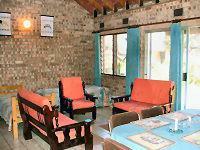 St. Lucia Wilds Self Catering Accommodation is privately owned and managed and situated away from the busy town centre, but within walking distance of shops and restaurants. 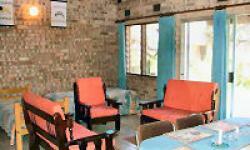 Our chalets are set in a natural tranquil garden on the banks of Lake St. Lucia, with an abundance of birds. Squirrels, banded mongoose, insects, red duiker, small reptilians, reed buck and bushbuck also visit and hippo graze in the garden overlooking the estuarine lake, from time to time. All chalets have access to the lake via a communal path through the premises to the front garden but have no view of the lake. We welcome you to enjoy the front garden view of the Estuary and watch the many birds in the garden or just relax on a lounger in the cool breeze under the trees or drink a "sundowner" while you watch the sun set over the lake. You are welcome to relax and cool down in our Swimming pool on the lake side. St. Lucia Wilds offers fully equipped self-catering holiday accommodation and you are invited to stay in our standard comfortable, no-nonsense, clean and neat units. 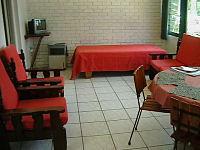 We offer joined chalets and affordable (budget type) units. No meals/drinks are provided. 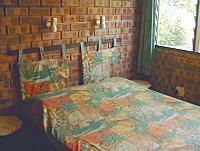 We cater for single travellers, couples, families, self-drive visitors and backpackers, especially nature enthusiasts. The owners live on site and are always ready to give information and share their passion for this environment, part of the iSimangaliso Wetland Park - World Heritage Site from the Zebras to the Mangroves to the beetles. We are a Birder Friendly Establishment with our own garden bird list and map to the hotspots. We offer 2 budget type units. These are part of the original house converted into 3 units. Each unit has own entrance with 6 steps to the door, bathroom, kitchen, one bedroom and lounge area. Ceiling fans in the bedrooms and other pedestal fans. Flat 4: Bathroom with sunken bath and separate shower. Small kitchen. 4 Single beds in the bedroom of which 2 are bunker. Flat 5: Bathroom has shower only. 1 Double bed and 2 single bunker beds in the bedroom and 2 single stack beds in the lounge. Next to Swimming pool and view of the lake. St. Lucia village is uniquely situated inside a World Heritage Site, the iSimangaliso Wetland Park, an ideal base to explore and experience our unspoilt natural heritage. The park stretches 220kms along the northern coastline of KwaZulu-Natal, against the warm Indian Ocean. We have most of the remaining swamp forests, 25 000 year old coastal vegetated dunes (the highest in the southern hemisphere), Africa's largest estuarine system (Lake St. Lucia) and grasslands. See the Big 5 (Lion, Leopard, African Elephant, Buffalo and Black and White Rhino) as well as the other 5 (Hippopotamus, Nile Crocodiles, African Fish Eagle, Leatherback and Loggerhead Sea Turtles and Whales) while you relax in the warm tropical climate. Watch the sun rise over the sea and set over the lake, awaken to the sound of the Trumpeter Hornbills, feel the sun on your skin and breathe in the clean warm air of one of the oldest and most diverse reserves in the world.